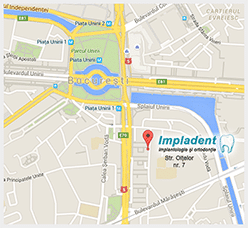 IMPLADENT CLINIC carries out its activities through a team work, providing their patients with a comprehensive dental service characterized by continuous professional development and by ‘use of techniques and advanced equipment in dental implantology as a computer wizard. Thanks to ‘ computer guided implantology is now possible to obtain a processing virtual or a real replication model of the anatomy of the area where they will be inserted implants , of which one can also determine the position and inclination in relation to the condition of the bone patient and the position of the tooth to rebuild, defined by the prosthetic preliminary study. The advantage of this method consists in the absolute certainty and control of the position of the dental implant, using every available bone portion without the risk of damage to sensitive anatomical structures and while reducing to a minimum the time of the intervention and the operative trauma, thereby improving the outcome after surgery. The patient after an x-ray, a CAT scan 3d with modern equipment, will allow the practitioner to view a three-dimensional computer model of your dental arch and thereby be able to design in a preliminary study of the case and the correct insertion of the implants. Examine the patient and take an impression for study models and, later on, the master cast. Fabricate and clinically validate the diagnostic tooth setup. Transform the tooth setup into a radiographic guide. This’ll be your prosthetic reference during your planning. Make a (CB)CT scan of your patient and the radiographic guide by following the double-scan protocol. Define implant position(s) from a clinical, anatomical and prosthetic perspective by combining the tooth setup with the patient anatomy. Collaborate effectively with your treatment partners. Help your patient understand the treatment plan by explaining it in a clear and visual way with the NobelClinician Communicator iPad® app. Go for fully guided drilling and implant insertion using a customized surgical template based on your treatment plan. Choose immediate loading and use the option to fabricate a provisional prosthetic solution before surgery. Alternatively, opt for early or delayed loading depending on the clinical indication.